Spring Break is fast approaching, so families and students may be looking to escape the blustering cold of Minnesota in favor of more moderate temperatures. But what happens if weather or other personal factors creep up and your travel plans are delayed or cancelled completely? The solution for all things is to take advance precautions, and travel is no different. By considering the advantages of travel insurance, you can rest easy that any change of plans can be only temporary. Marcy Jacobson, owner of Adler’s Travel, is a strong proponent of travel insurance. “Clients buy insurance on themselves, their homes and cars; they need to insure their vacations, as well,” she states. According to Jacobson, travelers sometimes save a long time for expensive vacations and getaways, and unexpected events can and do come up, which prevent the execution of those travel plans. Without travel insurance, in most cases that money is gone. But with travel insurance, the money already spent can often be recovered. “It honestly takes a lot of worry and burden off of the client when they have the peace of mind that it will be taken care of. We think of it as: I would rather have insurance and not need it, than need it and not have it,” says Jacobson. Insurance benefits and costs vary, and there are different types of plans based on your coverage needs. Jacobson explains, “Some are just for medical during your trip; some cover pre-existing medical conditions; some even cover if you have to cancel for a work reason.” The rates for these policies are on a per person, per trip cost and are usually based upon the traveler’s age at the time the policy is purchased. Additionally, many policies offer family coverage, which includes, at no additional charge, children age 17 and younger who are traveling with and related to the primary adult on the policy. 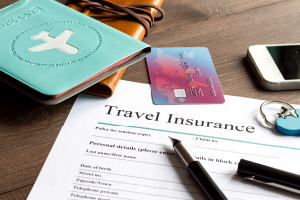 Some benefits of travel insurance kick in after travel has begun. Among these are emergency medical coverage, emergency medical transportation (which, according to Jacobson, can cost thousands of dollars), baggage protection, baggage delay, trip interruption, coverage for a missed connection, 24-hour hotline and sometimes, overnight hotel accommodations for missed flights. The best part is that these plans can usually be tailored to your specific needs. You can even exclude any members of your travel party who wish not to take out the extra travel insurance. This entry was posted in Travel on March 7, 2017 by Catherine H. Armstrong .